In Season 4 of 'Fear the Walking Dead', we will see the world of Madison Clark (Kim Dickens) and her family through new eyes – the eyes of Morgan Jones (Lennie James), who is joining the story from the world of 'The Walking Dead'. The characters’ immediate pasts mix with an uncertain present of struggle and discovery as they meet new friends, foes and threats. They fight for each other, against each other and against a legion of the dead to somehow build an existence against the crushing pressure of lives coming apart. There will be darkness and light; terror and grace; and the heroic, mercenary and craven, all crashing together toward a new reality for 'Fear the Walking Dead'. The 'Fear the Walking Dead Season 4' competition has now closed. Winners will be announced shortly. Competition opens at 5pm AEDT on Sunday 3rd February 2019 and closes at 11:59pm AEDT on Sunday 10th February 2019. Five winners will be chosen at random on Monday 11th February 2019. To successfully win, entrants must fulfil the above entry conditions before the time the competition closes. Current members/followers are eligible to enter the competition. Only one entry per person. Only one winner per household. To be a valid winner, the entrant must not have won a prize from SWITCH within the last 28 days. Each winner will receive one DVD copy of 'Fear the Walking Dead Season 4'. By entering, you agree to receive occasional emails from SWITCH in the future. If you decide to unsubscribe from these updates, any further entries will not be applicable. Only Australian residents are eligible to enter. 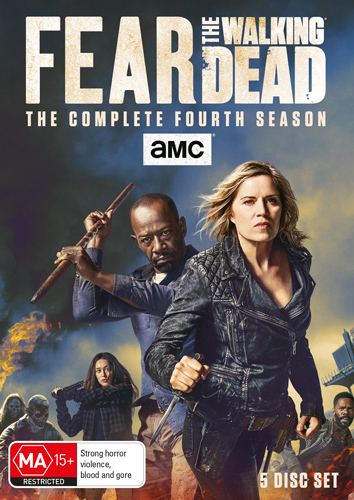 'Fear the Walking Dead Season 4' is available on Blu-ray and DVD on Wednesday the 6th February 2019 from eOne.